On Tuesday night, Northern Chicken played host to the latest Taste Alberta Prairie on the Plate dinner series. This time, the event highlighted one of Taste Albert’s commodity partners, Alberta Chicken Producers, to help celebrate that September is National Chicken Month. One could argue that every day at Northern Chicken is a celebration of Alberta Chicken Farmers, but chefs/owners Matt Phillips and Andrew Cowan were happy to close their restaurant for a one-night, set menu designed to celebrate farmers and their hard work and dedication to farming and to Albertan/Canadian consumers. Once the $50, five-course menu was released the event quickly sold out. My table scored the back room, which has a retro basement vibe, along with access to a custom Steam Whistle beer Crokinole board. Even though Andrew had a restaurant full of guests, he found a few minutes to explain the Canadian invited game and school The Spaniard before heading back to the kitchen. Back to the Prairie on the Plate menu. 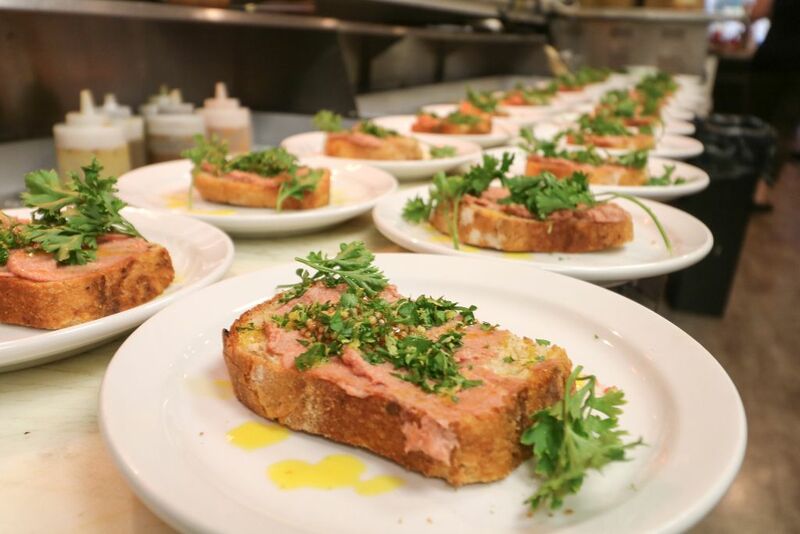 First up, we were served a chicken liver pate on a house crostini, paired with pickled mustard seeds and gremolata (a lemon-garlicky parsley condiment). My friend Simone noted that while some pates can be quite heavy tasting, she found the lemon flavour a nice addition that cut the fat, giving our appetizer a light, flavourful taste. Next up was a sweet potato and peanut soup. Chef Matt introduced the dish, which he explained hails from the southern United States. The roasted sweet potato soup made with peanuts, cumin, dark roasted chicken stock, celery was smooth – and once topped with maple spiced peanuts and the house-made cayenne oil – had a kick. Our table was like Goldilocks and the three bears. Simone loved the soup, had no problem finishing her bowl, and instantly wanted the recipe. For me, it was on the edge of my heat tolerance – full of flavour, but too hot to finish the last few bites. For a few ladies in my crew, well it was just too much heat to handle. I was a little scared to see hot sauce on the description for the next dish, but Andrew and Matt said I would be fine. Inspired by a hot wing, the boys served a Buffalo Brussels Sprout dish made with fried brussels sprouts, pulled roasted chicken, buttermilk dressing, and served with the house Doef’s Greenhouses red chilli hot sauce. The dish was served family style and an instant hit at our table. (I got a special, non-fried gluten-free version which was delicious, but since I know most fried things taste better, I can understand why this was one of the favourites for many on Tuesday night). The star of the night was served as our main dish for the evening. The classic Northern Chicken fried chicken was served alongside cold-pressed canola confit potatoes and drizzled with honey and thyme. I can’t give a personal review of the fried chicken, but I can say my table lapped it up. Instead, this gluten-free girl received roasted chicken, and I loved the honey-thyme drizzle. I may not be able to indulge in the fried chicken at Northern Chicken, but I know I will never go hungry there. What is more important for me, is that I feel safe eating there, knowing that Matt and Andrew take allergies seriously, and that bacon cream corn is always available on their regular menu. Our table was pretty stuffed after four courses, which turned out well for the Spaniard. In addition to plowing through his piece of roasted pear and cinnamon pie, he got to go home with two extra pieces from ladies at our table who couldn’t manage another bite. Since I didn’t have batter on my chicken, I had room for the generous gluten free portion. The Spaniard, Sean, Cam and I stuck around to play what turned into a best of three Crokinole game.I found the game is most competitive played in pairs – and it is highly addictive. Ask the next time you are heading to Northern Chicken, Andrew wants more people to come play, or come challenge him to a game. I told Andrew my favourite dish of the night was the chicken liver pate. I recommend complimenting the chef whenever possible because my kind words got me sent home with a little jar of extra pate.